This layered cake is really something else. You are looking at 3 completely different layers: chocolate chip cookie, then a crushed oreo layer topped with a brownie layer. The top is drenched in a chocolate ganache with lots of biscuits and cookies on the top. 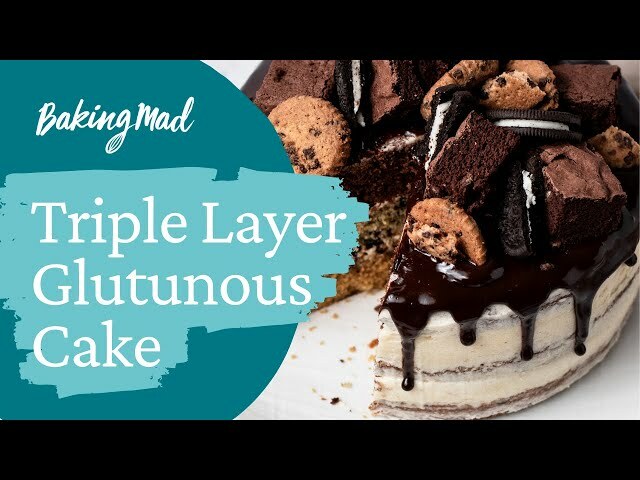 Although it looks like a challenge, it's the same basic sponge mixture with different additions for each layer which makes it relatively simple to make. You're going to want to eat a big slice of this. Put your stretchy pants on! Preheat the oven to 190ºc /170ºc Fan /Gas Mark 5. Add the eggs one at a time with a spoonful of flour to prevent the egg from curdling. Fold in the rest of the flour with the baking powder. Divide the mixture into 3 equal amounts. In one, mix the treacle and chocolate chips with 1 tbsp. milk. In another mix in the cocoa powder and 1 tbsp. milk. In the last mix in the crushed Oreos and 1 tbsp milk. Put each mixture into one of the prepared tins. Bake in your preheated oven for 25 minutes. The cakes may need a few minutes longer if they are on lower shelves. The cake is ready when the sponge springs back when pressed with a fingertip. Once cooked, cool in the tins for 5 minutes and then turn out of the tins and allow to cool completely on a rack. While the cakes are cooling, mix your buttercream by combining all the ingredients. Whisk hard for 5 minutes until it is really pale and light. When the cakes are cooled, place on your serving plate. Spread the chocolate chip layer with 1/3 of the buttercream, top with the Oreo layer; spread this with 1/3 of the buttercream. Finish with the chocolate layer. Coat the cake with the remaining buttercream. Spread this thinly to create a "naked" finish. melts. Allow to cool to room temperature. sides (you might not need it all) and top with oreos, cookies and brownie bits.